The Obesity Epidemic: FDA’s Waistline Continues to Expand! 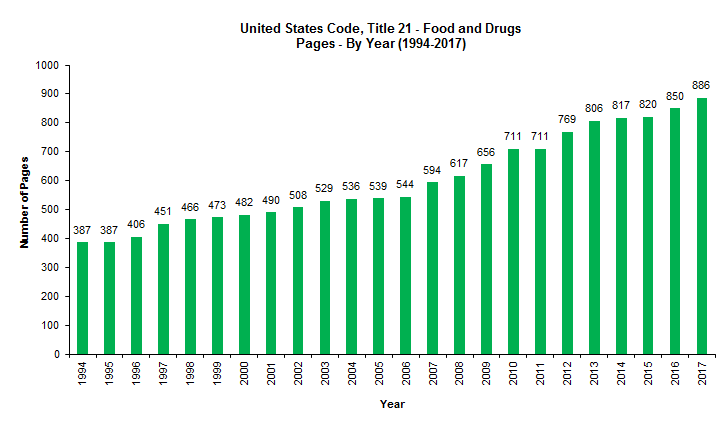 Waaaaayyyy back in 2012, when life (and practicing food and drug law) was simpler, something caused us to study and evaluate the year-over-year change (i.e., the change in girth by the number of pages) in Title 21 of the Code of Federal Regulations (“CFR”) from 1999-2012 and the year-over-year change in Title 21 of the United States Code from 1994-2011. Our data showed that between the period of 1999 and 2012, the CFR grew by a total of 423 pages (10%), and that between 1994 and 2011, the FDC Act grew by a whopping 324 pages (83.72%). Well, here we are in Fall 2018, a little more than 6 years after our original “waistline” post, and the world has changed a lot (according to BuzzFeed at least). Practicing food and drug law – and just keeping track of FDA’s day-to-day actions – has become more difficult and complicated. (But that’s what keeps things fresh and exciting for us!) So when we pulled up a copy of the most recent version of the FDC Act published by the House of Representatives (as amended through Public Law No. 115-234, enacted on August 14, 2018), and realized that the statute was once again changed with the President’s recent enactment of the “Substance Use–Disorder Prevention that Promotes Opioid Recovery and Treatment for Patients and Communities Act” (“SUPPORT for Patients and Communities Act”), we decided to revisit and update our old “waistline” post numbers. With all of the legislation enacted over the past 6 years and with the number of rules promulgated by FDA (and notwithstanding the Trump Administration’s so-called “2-for-1” Executive Order), we knew before our reassessment that there would be growth in both the CFR and the FDC Act. But by how much remained to be answered. As shown in the tables below, between 1999 and 2018, the CFR grew by a total of 760 pages (18.68%); and between 2012 and 2018, the CFR grew by 337 pages (7.5%). Meanwhile, between 1994 and 2017, the FDC Act grew by 499 pages (128.94%); and between 2011 and 2017, the FDC Act grew by 175 pages (24.61%). It is no wonder, then, that food and drug law is such a hot area of the law! 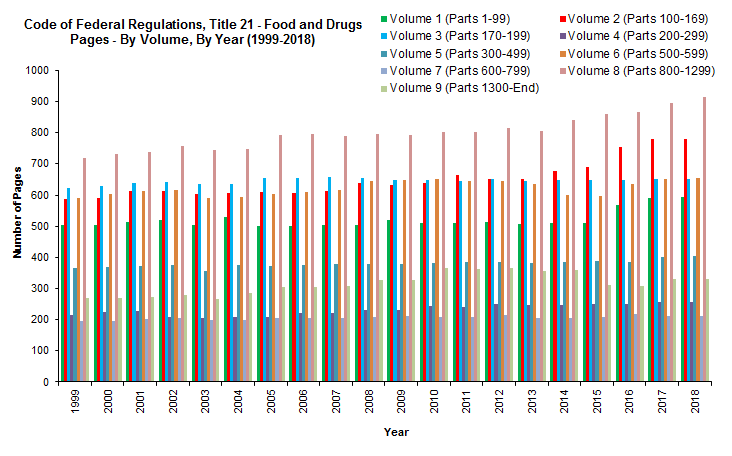 While most of the CFR volumes had modest growth between 2012 and 2018, and a couple that decreased in size, Volume 2 (foods) experienced the greatest growth percentage-wise (20%), while Volume 8 (medical devices) experienced the greatest growth in pagination-wise (131) (by just by a single page over the page growth in Volume 2). We noted back in 2012 that “our study shows that although there has been significant growth in the FDC Act, the CFR, which implements the law, has not kept up,” and that there’s “a theory for this seemingly odd result: FDA has been issuing far fewer regulations, and instead, has been implementing the law through guidance and other policy documents.” That’s still true today; however, there’s a twist. 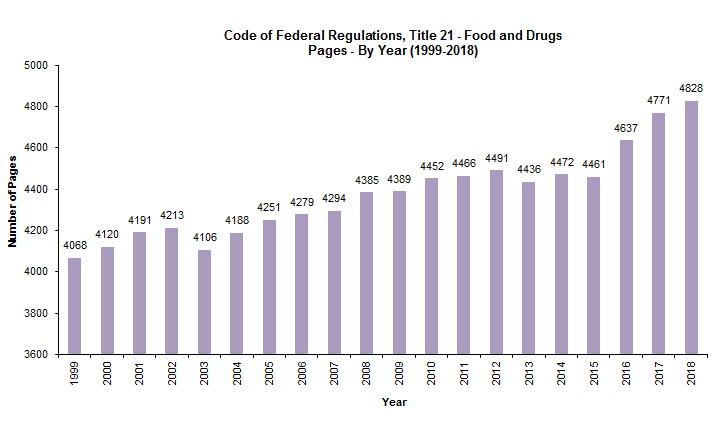 We don’t have enough time on our hands to count the number of pages of FDA guidance documents; but we can look into the total number of guidance document FDA has issued over the years. According to our data (obtained through the Internet Archive), in January 2015, FDA’s “Search for FDA Guidance Documents” webpage, identified 2,995 entries. Today that same website lists only 2,672 entries to search through. That’s a 10.78% decrease in the number of guidance documents in nearly 4 years. We’re not entirely sure why there’s been an apparent drop in the number of guidances, but it may be the case that FDA has withdrawn old and no longer relevant guidances (and perhaps as a result of the “2-for-1” Executive Order – see here). We’ll probably revisit all of these numbers again in several years. And just as we look back on 2012 from the vantage point of 2018 and reminisce about a simpler time, we’ll probably look back on 2018 as a simple time from the vantage point of . . . let’s say 2024. Enter your email address to automatically receive new posts to the FDA Law Blog via e-mail.